In addition to buttons of currently minimized programs, the taskbar also contains icons (quick launch) of the frequently used programs, such as Internet Explorer. Moreover, you can always add a desired program to the taskbar. But, there is a way to launch any of these applications without using the mouse. 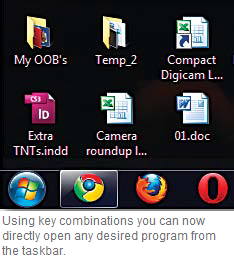 Once an application appears as a symbol in the taskbar, you can always open this program using a key combination. In order to do this, you can hold the Windows key down and push any of the keys from  to . However, the numerical keys on the numerical pad cannot be used for this purpose. The key combination [Win]+ opens the fi rst program from the right-hand side of the ‘Start’ button, the [Win]+ combination can be used for the second application and so on. You can launch the tenth program in the row with the [Win]+ key combination. In the process Windows counts the buttons in the taskbar from left to right, irrespective as to whether the application is permanently integrated or it is an additionally opened program. In case, an application has opened multiple instances, press the corresponding key combination multiple times one after the other, to toggle between the windows. NOTE: With this method, you can access only the fi rst ten applications in the taskbar. In Windows Vista these same key combinations launch the applications in the quick launch tray.